Can You Sing a Duet with Yourself? As a birder, I am fascinated, enthralled, and even overjoyed by the vocal capabilities of our feathered colleagues on this earth. Now, I’m not talking about vultures who push their envelope when they go so far as to moan. Or the magnificent Bald Eagles with their massive size and strength who speak in wimpy, high-pitched whistles. 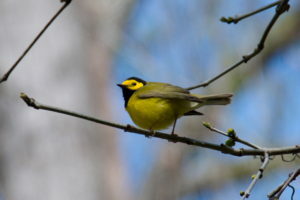 But listen to the rich song of a Hooded Warbler or the huge jumble of notes produced by the tiny Winter Wren. 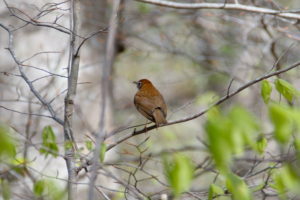 Or click on the link below, close your eyes, and imagine you are sitting outside on a calm summer evening as the sun is setting and listening to the incredible complexity of a Wood Thrush song as he demonstrates his virtuosity to any nearby female thrushes. You will be moved, perhaps enchanted. How does the thrush produce these remarkable sounds? He has a structure called a syrinx at the base of his trachea just above where it splits into two bronchi. Uh oh! Sounds technical. Must be one of those science thingies that make you want to snap shut your old biology textbook and go have a beer or maybe some apple juice if you are underage. But indulge me while I tell you where the name syrinx comes from. It’ll make the science medicine go down more easily. Zeus and Hera, the head honchos in Greek mythology, had their ups and downs as a couple. Zeus had the wandering eye and was smitten by the young lass Io. Hera, to say the least, was not amused. Zeus tried to hide Io and himself by covering the earth in a thick, dark cloud. But Hera knew better and ordered the cloud to be gone. Zeus was quick, though, and just as the cloud lifted, he turned Io into a young cow, a beautiful white heifer. Hera, just as quick to realize what had happened, asked Zeus to make her a gift of the beautiful heifer. Zeus could not refuse without revealing his ruse. So, Hera has the cow and needs to keep her away from her philandering husband. She knew just what to do. She put her in the charge of Argus, a watchman with a hundred eyes. Even when Argus slept with some of his eyes closed, he always kept a few open to watch the beautiful heifer. Zeus knew he couldn’t intervene directly (Hera would see right through him), so he called on his son, Hermes, and told him to kill Argus. Hermes went to Argus and tried to lull him to sleep by playing his reed flute and by telling him stories. Argus began to drift off, but it was one story that finally put him to sleep. Hermes’s story was about the god Pan and how he loved a young nymph named Syrinx (and you thought I had forgotten what this was all about!). Syrinx wasn’t particularly interested in Pan, so she ran away. Just as Pan was about to grab her, some of Syrinx’s nymph friends turned her into a bundle of reeds. 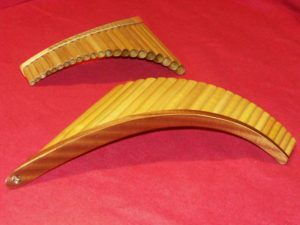 Pan didn’t want to lose Syrinx, so he made those reeds into a musical instrument that we now call panpipes or a pan flute. So that’s where the name for the song-producing organ in birds comes from. By the way, Argus fell asleep and Pan killed him. Io, as a cow, escaped but was tortured by biting flies set on her by Hera. She did eventually make her way to Egypt, where Zeus turned her back into a human and she lived happily ever after. The syrinx in birds is similar in function to our larynx, or voice box, but very different in structure. 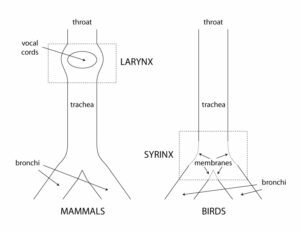 Our larynx is located just downstream from our throat at the top of our trachea (wind pipe), whereas the bird’s syrinx is located at the bottom of the trachea, where it splits into two branches, the bronchi, each branch going to one of the bird’s two lungs. Our larynx has special folds (vocal cords) inside it that vibrate when we talk. 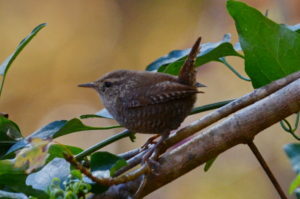 The bird’s syrinx has membranes in its outer walls that vibrate when the bird sings. We have to breathe out to talk so that the exhaled air makes the vocal cords vibrate. (Try talking while you breathe in. Let me know how it goes.) Birds can vibrate those syringeal membranes both when they breathe in and when they breathe out. And here’s the neatest trick of all. Because the syrinx is located where the two bronchial branches split apart, they can vibrate those membranes independently. So, they can make two different sounds at the same time. They can sing a duet with themselves!